Last week John was in town and so we had to celebrate. We chose Venkman’s, one of faves. There was also an acoustic set of Beatles tunes thrown in for free. Have you been to Venkman’s? Named after Bill Murray’s character in Ghostbusters. 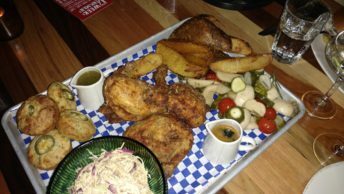 Thursday night their special is an entire fried chicken served with pickled veggies, slaw and potato wedges. All for $29. Eric and I decided to go for it and were rewarded with crunchy on the outside, moist on the inside chicken with puckery pickled veggies and creamy slaw. The potato wedges were a nice foil to all the tartness. And after we ate our fill of chicken, there was still plenty left to craft into a fabulous breakfast hash on Saturday. And jalapeno corn muffins, too! I love Venkman’s. You should go. And say hi to Chef Nick Melvin.